Business Mortgage | Hitelpont Zrt. We provide mortgages to foreign real estate purchasers in Budapest! Whether you’re starting or expanding your property portfolio on the booming Budapest market, Hitelpont might provide you proper financing to achieve leverage even as a foreigner. 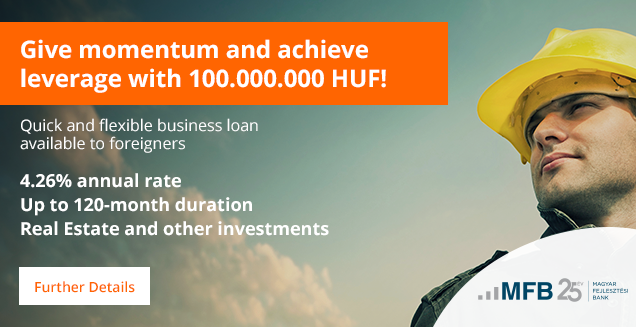 We provide business loan that is not only suitable for real estate transactions and investment projects, but also accepts start-ups and first-time buyers! Why to choose your Business Mortgage? Available for first-time buyers & start-ups. Accepts companies with foreigner shareholders. High potential leverage for real-estate investors. The amount can be anywhere between 1.000.000 – 100.000.000, with a 120-month maximum duration. In order to be eligible, foreign investors shall establish a Hungarian limited company. Newly established start-ups are also accepted. It depends on the complexity of the transaction, however on average it takes 2-4 weeks to finalize everything. It is our advice to get in touch with our advisors as soon as possible, even when you haven’t picked your target property. We know it is difficult to maintain a loan application process outside your country, therefore we are ready to help you with your application. Simply get in touch with us through our online forms (ask for a call-back or request a consultation), or visit our contact page for direct contact details.